In the spirit of the holiday season and for French Fridays with Dorie I made one last dish full of cream, eggs, bacon and cheese before fat free veggies make their triumphant return next week to ring in the new healthier year. This classic cauliflower gratin is that ‘Wow’ dish for entertaining which can be prepared ahead of time and baked off in the oven right before serving. I added finely chopped rosemary and thyme to the cream mixture before pouring it over the cauliflower and bacon. The instructions in Around My French Table call for whisking the eggs into the flour which I did even though I had never tried this technique before. I thought the mixture looked clumpy with bits of flour so I strained it before adding the cream and milk. I baked my gratin for 25 minutes, it puffed and turned golden. I like this variation with the bacon and herbs to liven up the classic cauliflower gratin. If you like potato gratin this cauliflower version is a delicious variation and would also make a wonderful brunch or lunch dish served with a green salad. 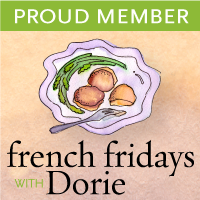 Please check out the other linksto this installment in the cooking schedule of our online group French Fridays with Dorie. A new year’s resolution might be something like, I’m going to go out and pick up that Around My French Table and start cooking with the group next year….just a suggestion!! Sorry it’s been requested that we don’t share the recipes, another reason to pick up the book. This is my ‘before’ baking the gratin picture taken outside before the sun sets and it goes down early here on our street in this part of the world at this time of year, but we still have enough light for a few blooming pansies in the garden. Once again I would like to wish everyone a Happy New Year! Now this would be a popular way to get Cauliflower into my family! I don't think anyone would turn it down. I love those little johnny jump ups! I have sort of forgotten about them and haven't planted them in a few years. When I was little they were my favorite plants and I always helped my mom plant them. I think I will need to get a few packs for my garden! It's nice to see those blooming flowers. We are many months away from that sight up here. 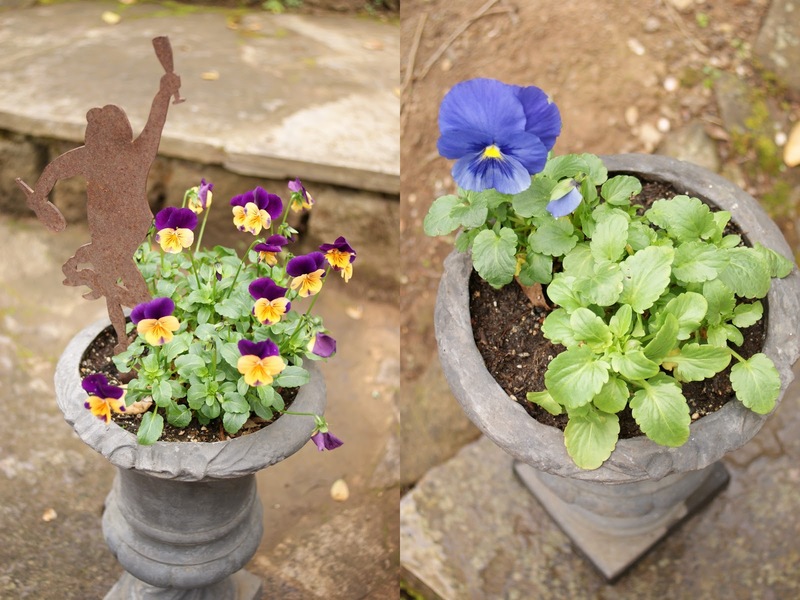 I like your baking dish…and your violas! like the pics, the mardi gras colored ones looks like johnny-jump-ups but I can't tell how tiny they are…..
Hmmm, looks delicious. Think it would be o.k. to leave out the bacon? Yes! This is traditionally made without bacon. A classic dish no doubt ! Love the bacon in it and the burnt melted cheese…mmmm yummy. Love this dish and I am glad I tried it out Yours look good with the fresh herbs. Happy New Year to you! Yours turned out very lovely! Appreciate the flower pics, too. Although winter's been extremely mild here (and my vegetable garden is actually still going), there's a distinct lack of color. Is that the Schramsberg riddler in your Johnny-jump-ups? It sure looks like him! Baconesque cauliflower gratin…be still the hardening arteries of my fat-loving heart! A very happy 2012 to you and yours, Patty! Keep those beautiful pics and recipes comin'! I would love to have this waiting for me when we return home from vacation. This gorgeous dish has lots of the things I love, mmm! My goodness, it looks like you are enjoying much warmer weather than I am! No flowers around here. Your gratin looks delicious. Ours was quite tasty as well, though we agree that it should be categorized as Special Occasion Food which is only brought out on nights when calories are not being counted. My first thought on tasting this is that it would be a great Thanksgiving side. I always love cauliflower gratin. This is mouthwatering Patty! Gorgeous! Great idea to add some herbs,wish I had thought of that! Your gratin looks fabulous…especially with the addition of herbs! Happy, happy New Year, my friend! Your gratin and pansies look so beautiful! I also love the blooming rosemary on your gratin. I hope you have a very happy New Year, Patty! I like your gratin–but it was the outdoor pansies that really caught my eye. Nice! Glad you enjoyed the gratin – and the time outside enjoying the flowers while you photographed! What a comforting and delicious side dish, Patty! The bacon is what makes it taste oh, so gooood!!! 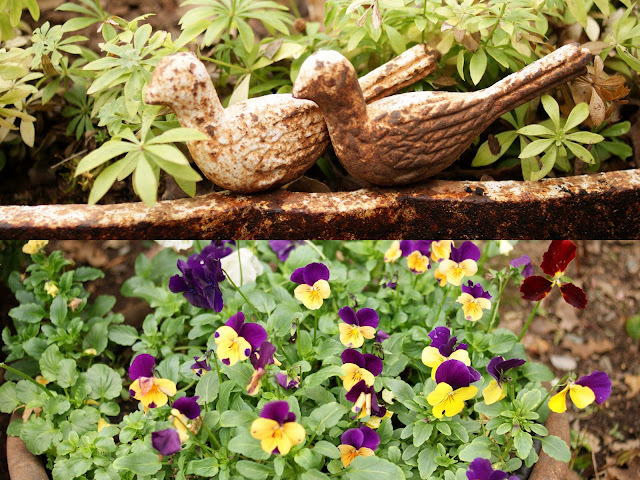 Lovely photos, and especially of your garden with the pretty pansies! Ours garden is in full bloom as well, everything green, and flowers just full of colors! Happy New Year to you and you dear family, in health wealth and prosperity! Love your results and that sprig of Rosemary across the top is perfect. It is not waist friendly but compared to the creme brulee and other sins we have been enjoying around here – this dish was like “health food” lately. Oh January and it's regime looms indeed. Happy New Year ! I'm so jealous of your blooming pansies. It's been mild enough in New England that I have a few herbs that haven't frozen yet, but their time is limited. Can't wait for spring! I love that you added herbs to the custard. Delicious idea! I've enjoyed cooking with you this year, Patty. Happy New Year 2012! The gratin looks delicious! I am afraid I can't say one last diet busting dish as the Chinese New Year is just round the corner…yikes! Really gorgeous – the gratin and all your flowers! I'm with you on the fat free veggies – after eating this I thought I needed an hour of treadmill. Happy New Year to you and looking forward to your cooking experiences next year! So beautiful! I loved this dish, too, and added a little garlic because I just couldn't help myself. Herbs sound like a wonderful addition. Happy New Year – I'm looking forward to seeing more of your gorgeous posts through 2012. I'm not sure you can have too many healthy New Years resolutions and be in this group. lol. Your gratin looks lovely as usual. Happy New Year to you! I love gratins, and this one looks amazing! Happy New Year to you and your family. This sounds like a great holiday side, I'll have to keep it in mind for next year. Have a very Happy New Year Patty! All the best for 2012! what delicious gratin! Patty your images are beautiful, and what a nice touch with the blooming rosemary, I've never seen it with the flowers! Happy New Year! and way to go 49er's! Sometimes the richness of French cooking scares me away, but I do like the fact this one can be prepared ahead of time. Totally has that 'wow' factor. 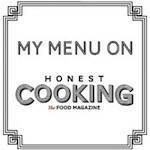 What a delicious sounding dish and your photos are stunning! What a fabulous gratin and your photos are incredible. Love the pansies. They do well in our mountain garden and bloom all winter and into spring. Happy new year. Thank you for your friendship and support. I bet the herbs really brought this one to life. I found it very bland but some thyme would've helped immensely. Your photos are lovely! Your dish is so pretty – I really like the rosemary garnish. Happy New Year! My first visit here — so glad I did! Love the gratin. (What's not to love1) And maybe, just maybe, I'll get the book. My hints for a Christmas present didn't pan out. This dish is absolutely beautiful, Patty. I'm always looking for new ways to use cauliflower and this one looks like a sure winner. Wishing you and yours a very Happy New Year, my friend! I loved your opening phrase! Lovely gratin & flowers! I so have to pick up Dorie's book. This cookbook will be my next investment for sure! I've made something similar with cauliflower, but this recipe looks much more tasty – gorgeous gratin! Dearest Patty…Happy New Year my friend. What a great way to start the year off right…a very appetizing gratin indeed. Now, let me backtrack a little and see what I've missed from your posts. Your first photo is an eye catcher. Really great. Loved the dish to, it was a great alternative way to make cauliflower. Patty, Your Cauliflower bacon gratin looks fabulous! Wish I was able to make this but I have had so much company over the holidays…it was hard to keep up. Looking forward to the brioche! Happy New Year to you and your family!! This is a very tempting dish for me, and I have eaten so much lately I had to give it a pass, lol. You managed to make it look beautiful by the way, which is no easy feat! Patty me encanta la coliflor gratinada es realmente exquisita ,bellas imágenes de pensamientos son flores hermosas que alegran el jardín,abrazos hugs,hugs. Happy New Year! Love the sound of the herbs in your version – it would definitely add some flavour oomph.